7 Home Remedies for Angular Cheilitis That Work a Treat! Hi. I'm hoping you can help me. I have really bad cracks/split lips in the corners of my mouth & they are incredibly painful. I seem to be getting them regularly all of a sudden & I don't know why? Do you have any home remedies or cures for this & know of any supplements or foods that I can take to help prevent this problem from happening again down the track? Thank you. Angular cheilitis (also known as perleche, angular stomatitis, cracks in the corners of the mouth, cracked lip corners & corner of mouth sores) is mainly caused by a fungal infection, normally candida albicans. If you regularly get cracks in the corners of your mouth then you will usually also suffer with yeast infections as the two go hand in hand in most cases. A bacterial infection can also cause angular cheilitis. When saliva gets trapped in the corners of the mouth, it eventually dries & causes the skin to crack. The warmth & moisture in the corners of the mouth then create a perfect environment for fungus or bacteria to grow & multiply. Symptoms of angular cheilitis include soreness, irritation & inflammation in the corner(s) of the mouth. You may also experience bleeding, redness, blistering, swelling, itchiness, cracking & crusted lips. In many cases, your lips will feel like they're on fire, especially you continue to lick them (which is the worst thing you can do). Natural Treatment for Cracked Lip Sores #1... Yogurt: Because angular cheilitis is primarily caused by a yeast infection (candida), it makes sense that yogurt, which is one of the standard treatments for yeast infections, would also work for cracks in the corners of the mouth. Yogurt contains probiotics, particularly the lactobacillus acidophilus strain, which kill candida yeast. Simply apply some natural yogurt to your angular cheilitis with a q-tip & leave on. Continue to do this as many times as you can throughout the day, especially before bedtime, & you'll find your mouth sore(s) either gone overnight or very close to being healed. In addition to this, make sure you eat plenty of natural yogurt every day to kill off the bad bacteria (candida) in your gut. Remember this... by destroying the bad bacteria internally you prevent it from being able to wreak havoc externally (and cause problems such as angular cheilitis). Home Remedy for Angular Cheilitis #2... Coconut Oil: Organic coconut oil is a powerful anti-fungal & antibacterial agent. Coconut oil is also an excellent moisturizer, so it helps soothe & moisturize your cracked lip corners. Apply a small amount of organic extra virgin coconut oil (only use this type) to the affected area as many times throughout the day as possible. You can also add a small amount (one drop) of tea tree oil to your coconut oil for extra benefit if you have some handy. Natural Remedy for Corner of Mouth Sores #3... B Complex, Zinc & Iron: B vitamins are essential for the normal growth, repair and development of skin & connective tissue, mucous membranes & immune response. Zinc & iron are also crucial for the peak functioning of the immune system. Virtually everyone who sufferers from angular cheilitis & starts taking a good quality B complex supplement, along with iron & zinc, is cured within 2-3 days. What's more, if you continue to take your B group vitamins, along with zinc & iron (which hopefully you do) you'll never have to suffer with angular cheilitis again! So find yourself a high potency B complex supplement (such as these) & make sure it contains 75-100 mg's of B2 (riboflavin) per serve. Take one every day with food. The zinc & iron should come in either colloidal or chelated form. For dosage recommendations, follow the directions on the side of the bottle. can buy bee propolis in salve, tincture or ointment form. The Manuka honey can be bought online or from health food stores or even your local supermarket. Apply a small amount of either to your cracked lip corners 3-4 times daily. Home Remedy for Cracked Lip Sores #5... Olive Leaf Extract (OLE): Olive leaf extract is the most powerful bacterial & fungal killer on the planet! It's regularly prescribed by alternative health care practitioners for treating yeast infections & bacterial & viral infections. If you regularly suffer from angular cheilitis & candida then you have an overload of toxic & harmful organisms residing in your body. Get rid of these parasites & you'll cure your angular cheilitis & yeast infection problems for good. All you need do is find a good quality "super strength" olive leaf extract (do not use the standard strengths as these are not strong enough) & take this every day for 3 months. This will ensure a thorough & complete cleanse of all bacteria & fungus in the body (remember, kill bacteria & fungus internally & you kill it externally). Follow the directions listed on the container for the recommended amounts. In addition, make sure that the OLE you buy has an oleuropein content (the active ingredient) of at least 20%. Anything less will not be effective. Here's some of the best OLE brands on the market if you're interested... Super Strength Olive Leaf Extract. Natural Cure For Angular Cheilitis #6... Aloe Vera: Aloe vera helps with just about any type of skin problem - and angular cheilitis is certainly one of them. Aloe vera contains potent anti-fungal, antiseptic & anti-inflammatory properties & is great for relieving the pain & inflammation associated with cracked lip sores. If you have some aloe vera in your garden, cut off a small slice & extract the gel. Refrigerate for about an hour then apply to the cracked & dry corners of your mouth. Continue to apply as often as you can throughout the day. 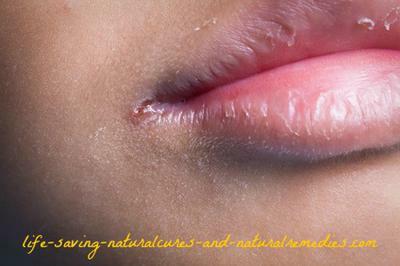 Natural Treatment for Cracked Lip Sores #7... Milk of Magnesia: Magnesium is a powerful antibacterial & anti-fungal mineral. It works a treat for eradicating thrush (even in babies) so it's no surprize that it also works for angular cheilitis. Milk of magnesia is a liquid form of magnesium that's completely non-harmful. Take 20 ml's (0.8 oz) of the non flavored milk of magnesia & "swish" this around in your mouth for 2-3 minutes to kill the bacteria & fungus in your mouth - spit out afterwards (do not swallow). Then using a Q-tip, apply the milk of magnesia to your cracked lip corners. Repeat this process 3 times daily, particularly before bedtime, for some extra fast healing & relief. - Take MSM biological sulphur: Sulphur is known as the healing mineral. Take a teaspoon of MSM biological sulphur (a safe mineral supplement) every day to prevent the re-occurrence of angular cheilitis. - Eat lots of garlic, turmeric, cloves & oregano: All of these herbs are anti-viral, anti-bacterial & anti-fungal in nature. Clove oil in particular is extremely effective for preventing dry lip problems such as chapped lips & angular cheilitis. - Avoid refined sugars: Yeast fungus feeds off sugar so cut this additive out of your diet. - Eat pumpkin seeds, chia seeds & sesame seeds. These are rich in iron & zinc, along with crucial B group vitamins. You can never overdose on these so eat them to your hearts content! - Consume eggs: Eggs are also incredibly rich sources of B vitamins, zinc & iron, as well as healthy essential fats that help prevent dry skin & dry lips. - Use extra virgin olive oil: Like olive leaf extract, olive oil also contains potent antiviral & anti-bacterial agents. Use this oil in your food as much as possible. - Consume lots of probiotic rich foods: By consuming plenty of probiotic rich foods (yogurt, sauerkraut, etc), the bad bacteria that's causing your angular cheilitis will be a thing of the past (& so will be your yeast infections). You can never have too many acidophilus rich foods so be sure to eat as much of them as you can. Here's a handy website on ways to easily make your own... Cultures for Health. - Avoid licking your lips as much as possible. - Drink plenty of water to avoid dehydration & dry lips. So hopefully these tips & remedies help you out Lisa!